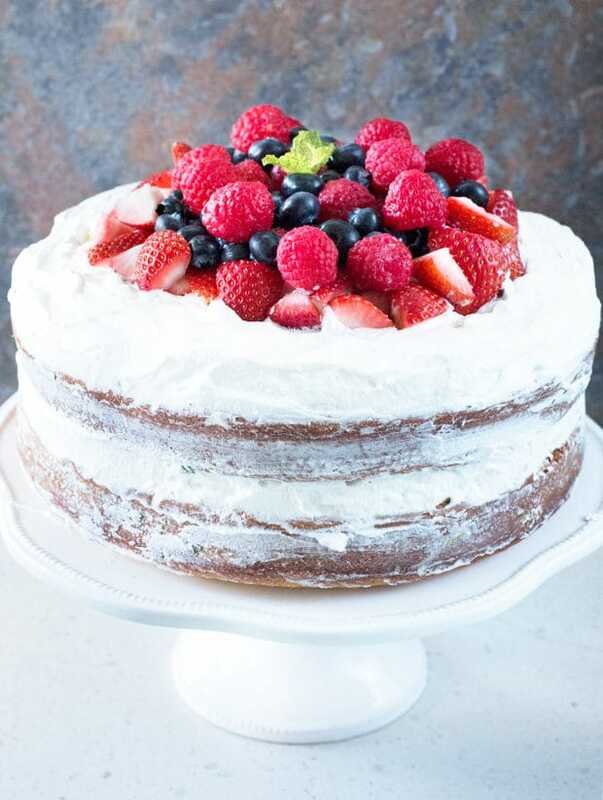 Mixed Berry Vanilla Bean Cake is how I show my patriotic spirit – in dessert form! 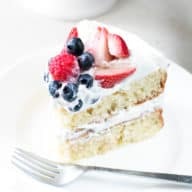 The red, white and blue cake starts with a flavorful vanilla bean cake and light-as-air lemon mint whipped cream frosting, topped off with all the fresh berries your heart desires. Memorial Day is this weekend. Anyone else wondering where the hell the year went, or am I the only one? But I digress. The reason we’re all here is THIS CAKE. This cake… oh boy. This one probably tops off my best cakes of all time. The vanilla bean cake is one thing – it’s so moist and thick, but light and airy at the same time (don’t ask me how this is possible, it’s some sort of baking science). Then you add in whipped cream frosting that has fresh mint and lemon zest beat right in for a surprising pop of freshness. Finally, you can really take advantage of prime berry season by piling all the fresh raspberries, blueberries and strawberries you want on top. Red, white, and blue, baby. You can’t go wrong with those colors. Really though, just imagine topping off your massive Memorial Day feasting with a gorgeous, fruity, patriotic cake like this. Baller chef status. BOOM. BONUS TIME: I’ve got a ridiculously awesome roundup for you guys below the recipe… Don’t miss it! 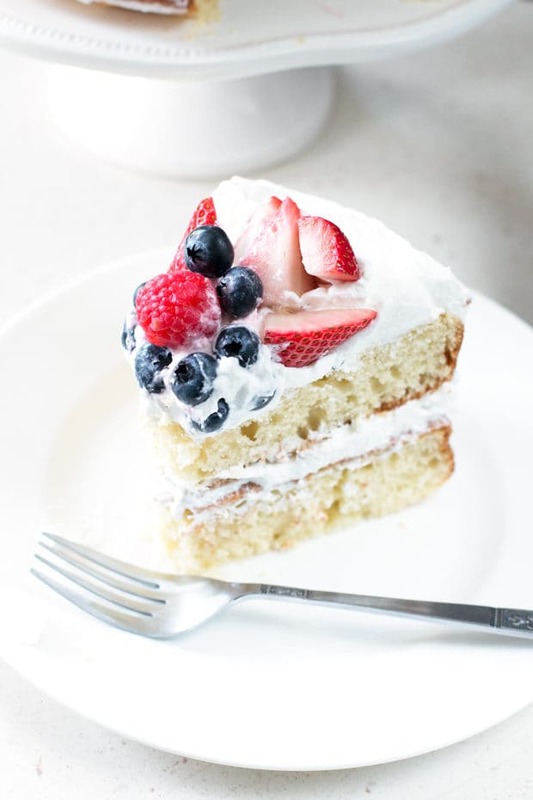 Pin this Mixed Berry Vanilla Bean Cake recipe for later! 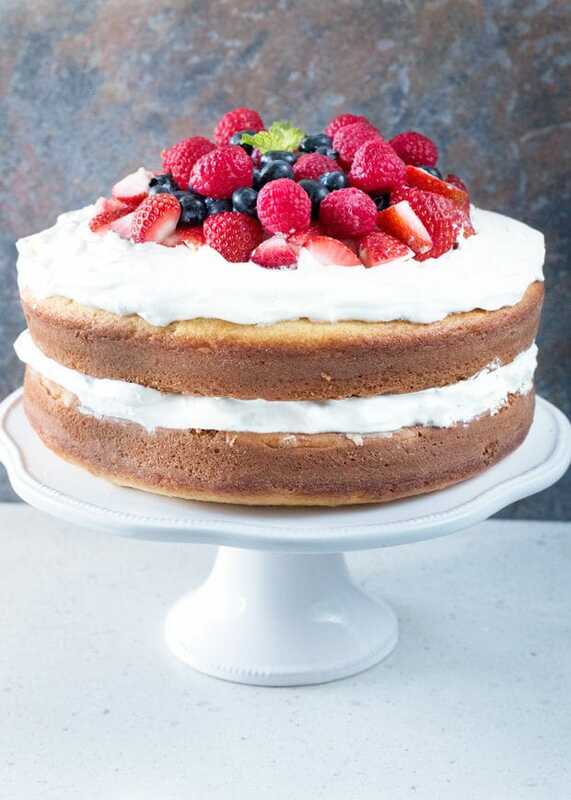 Fresh, fruity and light, this cake is perfect for any summer celebration you have coming up. Preheat oven to 350 degrees. Grease and flour two 9-inch cake pans. Set aside. In a large bowl, sift the flour, baking powder, baking soda, and salt together. Set aside. In the bowl of an electric stand mixer, using the paddle attachment, beat butter on medium speed with the sugar until it forms a soft paste, approximately 1 minute. Add the eggs one at a time, beating after each until incorporated, making sure to scrape down the sides of the bowl as needed. On low speed, alternate between adding the flour mixture and the buttermilk, working in two batches for each. Once fully incorporated, beat in the vanilla bean paste. Divide the batter evenly between the two cake pans. Bake in the oven for 25 to 30 minutes or until a cake tester comes out clean. Transfer the pans to wire racks and cool for at least 15 to 20 minutes, before turning out the cakes to cool completely. Once the cakes are cool, use a serrated knife to cut off the domes of each cake so the cake tops are flat. Set aside. In a clean bowl, using a stand mixer or electric mixer, beat the heavy cream with the sugar until it forms soft peaks. Add the mint leaves and lemon zest, and continue to beat until the cream forms stiff peaks. 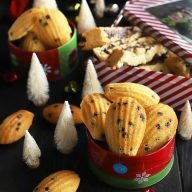 Add one of the cakes to your desired serving platter or cake stand. Spread a thick even layer of the whipped cream on top of the cake. 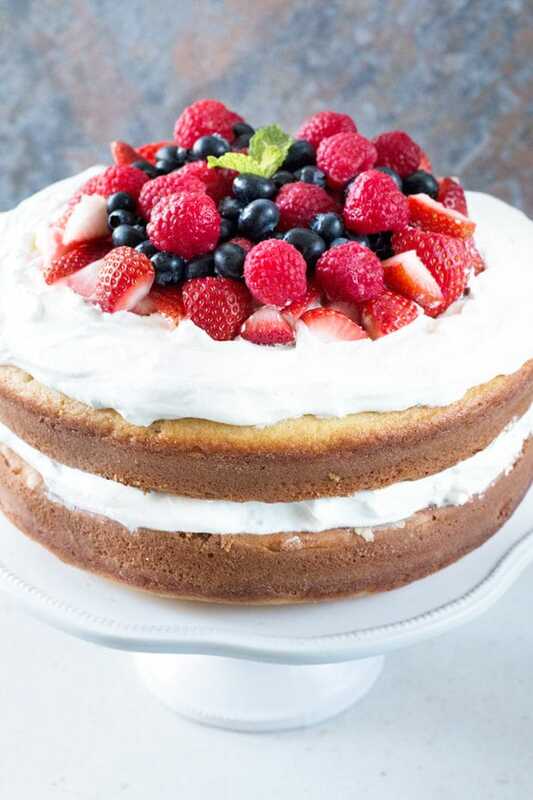 Add the other cake on top and decorate as desired with remaining whipped cream frosting and berries. 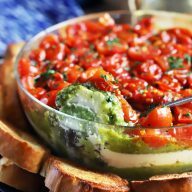 Garnish the top with fresh mint leaves and serve! Memorial Day kicks off the unofficial start of summer, so you know what that means… Time to bust out those grills because it’s BBQ season! As a little celebration, I’ve teamed up with some of my fav bloggers to bring you the Great Blogger BBQ. 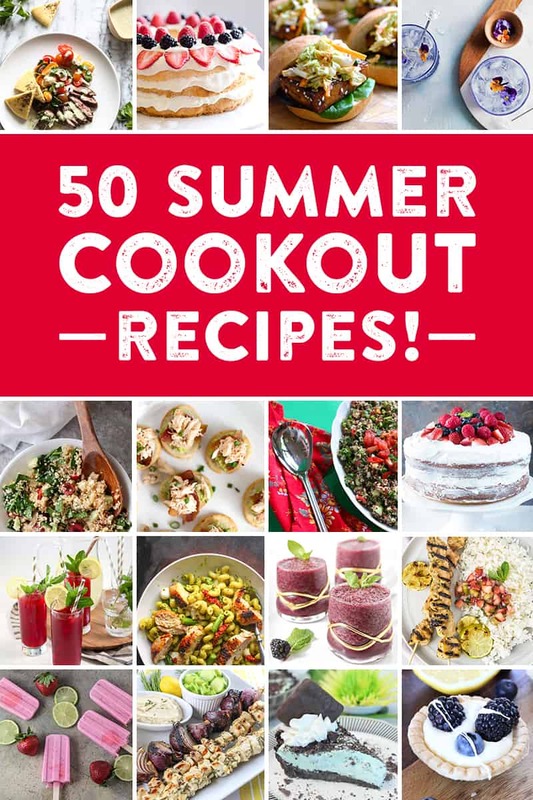 We’ve got 50+ recipes ideas to absolutely kill it at your next summer soiree – check them out below! Marinated Skirt Steak with Sweet Corn and Cherry Salad by Domesticate ME! This cake is simply stunning and just screams Summer! Meghan, this is the epitome of summer desserts! And I can’t believe it is already Memorial Day–where does the time go? 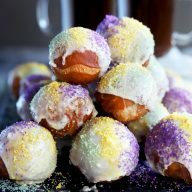 Oooooh girl this looks amazing! I love a good seasonal cake–it gives me a great excuse to eat several pieces 😉 Happy #greatbloggerBBQ!